A heat pump is a device that draws heat from the outside and transfers it into your house to provide space heating and domestic hot water. There are two kinds of heat pumps; air source heat pumps and ground source heat pumps. Ground source heat pumps which use bore holes or thousands of meters of plastic pipe buried in the garden tend to be expensive to install and less popular in Ireland. 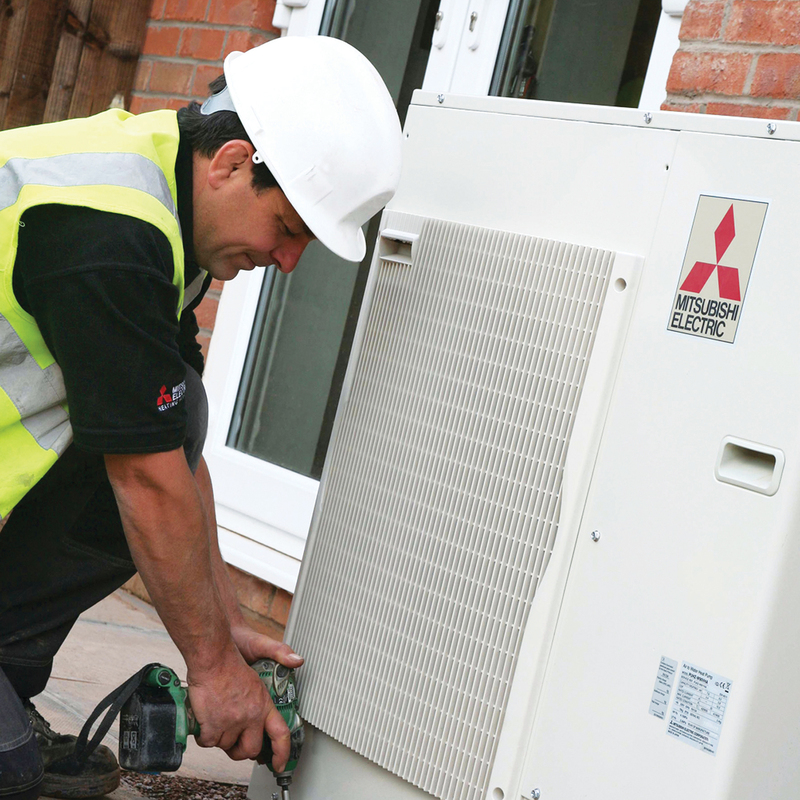 Air Source heat pumps are booming in popularity due to their simplicity to install, cost effectiveness and ease of maintenance. 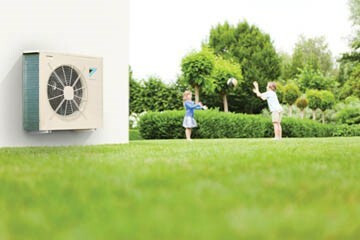 An air source heat pump (ASHP) is usually placed outside at the side or back of a property, and takes heat from the air and boosts it to a higher temperature using a heat pump. This heat is then used to heat radiators or under-floor heating systems and hot water in your home. The pump needs electricity to run, but as it typically produce 3-4 units of heat for each unit of electricity it is classified as a renewable energy source and has the potential to save homeowners considerable money on their heating and hot water bill. - Proven technology already well established in other EU countries. 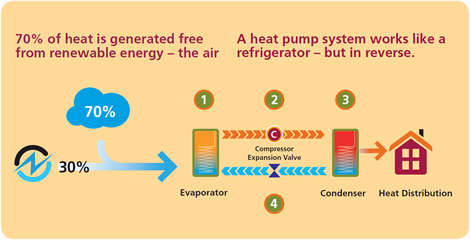 An Air Source Heat Pump (ASHP) is a refrigerant based system, like your refrigerator at home. The system can absorb low grade heat from the air, and raise its temperature efficiently to be suitable for space heating and/or hot water. Ecodan is an air source heat pump system and can provide water temperatures of up to 60°C (without backup electric heater) in ambient temperatures as low as -25°C*. 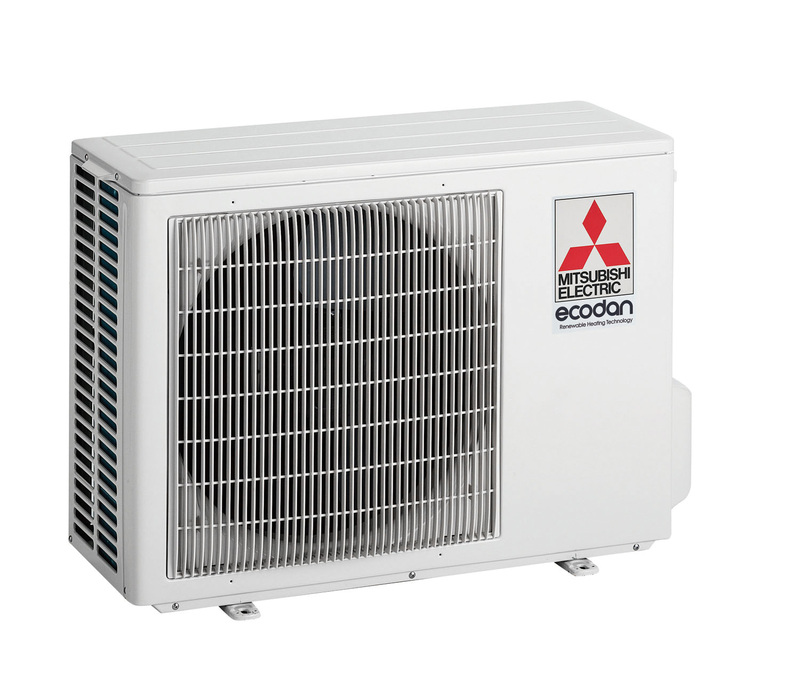 The Ecodan heat pump range is suitable for everything from a small domestic to a large application. - Optimised systems from 4kW to 688kW. For every 1kW of electricity fed into an Ecodan heat pump unit (i.e.the outdoor part of the Ecodan heating system), you could get at least 3kW of heating energy. The overall system efficiency and energy savings will depend on the comparison with your current heating system, satisfactory system design and installation, and operational settings i.e. how you use the heating system. MELCloud is a new Cloud based solution for controlling your Mitsubishi Electric Ecodan systems either locally or remotely by PC, Mac, Tablet or Smartphone via the Internet. Set up and remote operation of your Ecodan heating system via MELCloud is simple and straight forward. - Share / restrict access and control of the Ecodan system. All you need is a wireless connection in your home or building where the Ecodan is located and an internet connection on your mobile or fixed device. To set up the system, the router and Ecodan Wi-Fi interface needs pairing and this is done simply and quickly via the WPS button found on all mainstream routers.